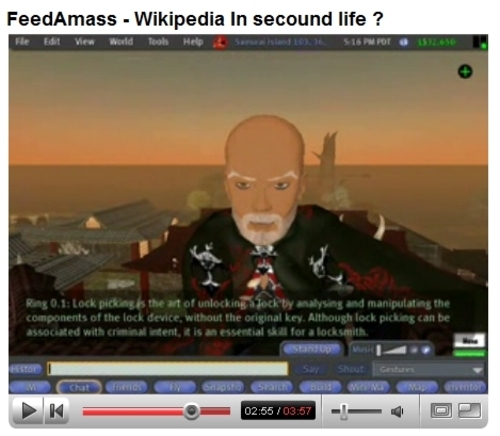 If this works half as well as the demo suggests, it's a spectacular innovation: a script that sends a search query from Second Life chat to Wikipedia, and back in-world as a silent message to the user. It's all contained in a ring worn on your finger, and in the video, one of its creator is able to query and receive information on lockpicking and Missy Elliot (!) in a matter of seconds. The world's repository of knowledge, in other words, at (and on) an avatar's fingertips. I've messaged Oran Arrow for more details, and will post as they arrive. Meantime, read more about it here. Update, 11:43AM: In Comments, Kate recounts her first trial-run with the all-knowing (sorta) ring. Update 2, 6/29: After the break, Oran explains how the ring works, and offers a SLURL for getting one of your own. From a technical point of view, how does this work? Oran Arrow: I forged a ring in SL, I added a script that calls our FeedAmass script on a remote server (outside SL) using classic "HTTPReques". Our PHP based code is tunneling the information back to SL. tools, it simply gathers the content following a logical pattern*. For example: Wikipedia, amazing and useful as it is, is lacking the possibility to interface directly with the content, therefore doesn't support feeds or data syndication. In real life we use FeedAmass over mobile phones, sending an SMS of a terms and getting back: wikipedia definitions, Google define data, language translators and... Well, everything else mostly. AS I mentioned before, FeedAmass can run on any device, [and] we see SL as a device. FeedAmass can get more then the first 300 words as well as pictures videos and other rich formats. At this point of time we would like to keep it clean and fast, and with that said - text only. This is a direct teleport link to a FeedAmass ring vendor. I bought one to play with it after seeing this post. I haven't had time to do much, but it's kind of neat. Wikipedia Ring: Wikipedia: The second (SI symbol: s), sometimes abbreviated sec., is the name of a unit of time, and is the International System of Units (SI) base unit of time. SI prefixes are frequently combined with the word second to denote subdivisions of the second, e.g..
Wikipedia Ring: Wikipedia: Melissa Arnette Elliott (born July 1, 1971 in Portsmouth, Virginia), better known as Missy Elliott, is an American rapper, singer, songwriter, MC, and record producer..
Wikipedia Ring: Wikipedia: Wikipedia (IPA: /ËwikiËpiËdi.É/, /ËwÉªkiËpiËdi.É/, or /ËwaÉªkiËpiËdi.É/ (Audio (U.S.) (helpÂ·info)) is a multilingual, web-based, free content encyclopedia project..
World of Warcraft (commonly abbreviated as WoW) is a pay-to-play massively multiplayer online role-playing game..
Wikipedia Ring: Wikipedia: Galileo Galilei (15 February 1564 â 8 January 1642) was an Italian physicist, mathematician, astronomer, and philosopher who is closely associated with the scientific revolution.. Honestly for me I would just tab out to Wikipedia so I could see more than one sentence. But it's kind of neat. This is the kind of "innovation" that drives me nuts. Is switching into a browser to run the search yourself really that bad? It's maybe a little more convenient to whisper something to an attachment, but what you get back is so limited as to be not really worth the convenience. I don't think Second Life will ever succeed as a place where you do everything. We need to recognize that it's just another tool for connecting to information and people, and that the web is really, really good for certain sorts of things that we don't need to recreate in SL. Designers should be focusing on building systems that do things that aren't possible on the web, not recreating things we can do better in other media. The NOAA visualization work that everyone loves to tout has the same issue - it's not nearly as good as a web based weather map because it's fundamentally 2D data which print and web media are really quite good at displaying. Very cool gadget. Wish it didn't emit particles when being worn though. I also got myself one of those "magic" rings. I must say that it works perfectly, and it's a constant aid since I wasn't even aware of the need to find-out things and know stuff, while navigating SL. Sure, I can look it up it myself, but that would only hassle me and take-up valuable time, especially when involved in a conversation or other interactions in SecondLife. It's just more comfortable and efficient. I can't wait for it to be more versed and connected to more sources. Literally. I just can't afford to wait. This thing just does it for me. It's all about how easy, fast and ultimately helful. And bottom line - it is! Currently, I can't seem to think of something that better serves my interests or performs these tasks for me. But also, when considering the big picture, and by that I mean the whole web surfing experiance (presently and in the future) - there's no reason to "leave home" without it. This is a great start. It would be even more useful if it had an option not to send a silent message but to share with people on the chat channel.